They accused the governor of alleged fraudulent activities, nonpayment of workers? salaries and non-performance. The members were said to have moved into the assembly complex amidst tight security around 6am but some pro-Ortom youths who got wind of the sitting reportedly invaded the house to prevent the lawmakers from sitting. They (the youths) were dispersed by security men, thus paving the way for the lawmakers to sit. The session, it was gathered, lasted for about one hour during which the members suspended the 15 members loyal to the governor. The house has 30 members .The group loyal to the governor led by the new speaker, Titus Uba, claimed to have 22 members and the other group loyal to Senator George Akume have eight members. But Ikyange said that 12 members on Monday met and took decision to commence impeachment process against the governor. He noted that the group had got an order from the court directing banks to give them mandate to open accounts for some workers which they allegedly used to siphon money. Addressing journalists at his official residence at the Commissioner?s Quarters along the Otukpo Road, the leader of the factional group, Ikyange, said 12 members sat to review the political development of the state and took the decision. According to him, two decisions were taken. ?One, the members looked at the action of some members who invaded the house of assembly causing unrest in the state and concluded that the conduct was unacceptable. We have given the 15 members six months? suspension each. ?Another item was the motion brought by the majority leader of the house to give a notice of impeachment to the governor because of some impeachable offences he (the governor) has committed in the past three years. ?We look at the offences and saw they have merits. The house found N50m fraud in each of the 23 local governments running to N33bn in the past three years from the local government funds. Another N22bn of state funds were misappropriated in the last three years by the governor. ?Also, the nonpayment of salaries of seven months to state workers, 11 months to local governments? workers and pensions up to 15 months as well as nonperformance which has affected the economy of the state are some of the governor?s misdemeanour,? Ikyange said. When asked whether the members formed a quorum, Ikyange said that 12 members sat during the sitting. Ikyange said that the group would in the next seven days transmit the notice of impeachment to the governor. But the group loyal to Ortom which held its plenary session at the Banquet Hall of the Government House, Makurdi, also suspended the other seven members who held session with the impeached speaker. The ?majority leader? of the G 22, Paul Biam, described the sitting by the Ikyange-led group as illegal, saying that the group had secured a court injunction restraining the impeached speaker from parading himself as speaker. ?In spite of the injunction restraining the former speaker from parading himself as the speaker of the eight assembly, this morning as we approached the assembly we found security men armed to the teeth with armoured vehicle and refused to allow us to enter the chambers. ?We learnt that seven members including the suspended speaker without the mace, clerk of the house and the clerks at table without forming a quorum, held an illegal session. ?During the session, the house took decision and we have suspended the seven members,? Biam said. When asked why the members at the Monday sitting were 18 instead of 22 earlier claimed, the ?majority leader? said that the four members had gone to Abuja to honour the invitation of the EFCC. However, while speaking, one of the four absentee members, Sule Audu, strolled in. But Ortom on Monday described the action of the eight members that commenced impeachment process as ?provocative.? The governor called on President Muhammadu Buhari to caution the Inspector-General of Police, Ibrahim Idris, and the Director General, Department of State Services. Ortom said that the eight members allegedly had the support of the former governor of the state, George Akume, IG and DG, DSS. He however expressed assurance that their move would fail.
? I know that the President is not aware of the impunity by the IG and DG DSS. The action of the eight members is provoking, they have the support of the police and the DSS. ?Police detachment from Abuja on the directives of Akume, IG and DG SSS forcefully allow the eight members to occupy the house of assembly despite the court injunction restraining the impeached speaker from parading himself as the speaker. ?Whereas, police sent away the 22 members last Friday when they wanted to sit but today the same police provided security to the eight members. ?As a law-abiding citizen, I believe in the rule of law and I will pursue it to tackle this illegality. Is it an offence to join any party of my choice? I appeal to Mr President to rise and protect our democracy,? the governor said. Answering questions on the issues raised by the G8, the governor said that there was evidence of where the speaker collected money and did not account for it. But the Senate President, Bukola Saraki and Speaker, House of Representatives, Yakubu Dogara, have described the move by the factional lawmakers to impeach Ortom as ?a desecration of legislative sanctity.? 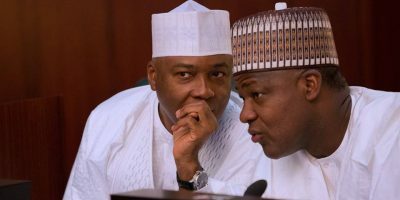 Saraki and Dogara faulted the situation where eight out of the 30 members of the legislature commenced impeachment process against the governor and allegedly with the support of the police, prevented the 22 other members who constitute more than two-thirds majority from the Assembly building. In a statement jointly issued in Abuja on Monday, Saraki and Dogara called on President Muhammadu Buhari to caution the police and stop them from being used to achieve political end. The statement was signed by Saraki?s Special Adviser on Media and Publicity, Yusuph Olaniyonu, and Dogara?s Special Adviser on Media and Public Affairs, Turaki Hassan. The National Assembly leaders said, ?We have monitored closely the development in Benue State in which the impeached Speaker, Terkimbir Ikyange, led seven other members to serve impeachment notice on Governor Samuel Ortom, while the 22 other members who constitute more than two-thirds majority have been prevented from having access to the chamber. We believe this is illegality and does not conform to parliamentary procedure on impeachment. ?We also note with surprise the role of the police in this undemocratic event in which the minority is seeking to impeach a governor against the position of the majority. We believe it is the sacred institution of the legislature that is being desecrated and rubbished in all these negative developments. ?The situation in Benue State House of Assembly has grave implication for the nation?s democracy and it represents a throw-back to the period of dictatorship in our country. It also represents how the police are being misused to achieve political end.? The presiding officers recalled a statement recently in which the Presidency derisively referred to an era in the past where a minority number of legislators was used to impeach governors who were unfriendly with the Federal Government. ?What we are seeing in Benue now is a return to that inglorious era,? they noted. Saraki and Dogara added, ?We believe this unlawful and unconstitutional move to impeach Governor Samuel Ortom by a minority should be condemned by all lovers of democracy, at home and abroad. ?We call on President Muhammadu Buhari to caution the police and prevent a breakdown of law and order. We also call on friends of Nigeria in the international community to lend their voice in condemning the perpetration of illegalities and actions that can subvert our democracy.? According to the National Assembly leaders, there is already a tense atmosphere in Benue State following the recent killings. ?Nobody should encourage any action or move which may exacerbate the security situation in the North-Central state. As leaders of the federal legislature, we are ready to work with our colleagues in both chambers of the National Assembly to prevent any attempt to destroy any state legislature or use it to derail democracy,? Saraki and Dogara stated. Also, the Peoples Democratic Party caucus at the House of Representatives, on Monday condemned the impeachment notice served on Ortom, describing it as ?an illegality and a gross violation of the 1999 Constitution.? The caucus, in at a news briefing addressed by the Deputy Minority Leader, Mr Chukwuka Onyema, called on President Buhari to wade in immediately by stopping the Nigeria police from aiding ?this assault on our democracy.